To play golf comfortably in cold weather, you need good gloves, on both hands. I own about a hundred pairs of FootJoy RainGrip gloves, which I keep in the way-back of my station wagon. (I stick their Velcro closures to the sides of the luggage compartment, which I think of as my locker room.) RainGrips work well during the winter, too, and on really cold days I wear two pairs, one on top of the other. FootJoy makes actual cold-weather gloves–called WinterSof–and several of my friends use those. Both kinds double as nose-wipers, and when they start to look shiny you can throw them into the washing machine. At the PGA Golf Merchandise Show, in January, I tried some winter gloves I liked a lot. 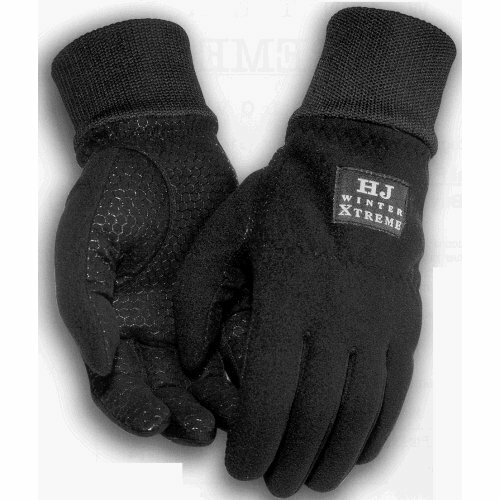 They’re called HJ Winter Xtreme, from a 40-year-old Korean company called HJ Glove. They look sort of bulky in photographs, but they fit snugly, and the palms and fingers are covered with a honeycomb pattern of grippy silicone, making them seem like something a wide receiver might wear. And they have extra-long cuffs, which you can tuck way up into the sleeves of your jacket. This entry was posted in Accessories and tagged Gloves by David Owen. Bookmark the permalink.